This thriller stars the delightful Hilary Swank as a doctor named Juliet Deverau who has recently broken up with her long-time partner and unfortunately for Ms. Deverau she becomes embroiled in all sorts of mess. 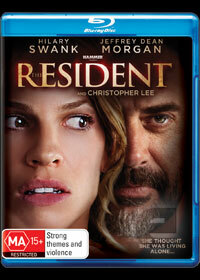 Before I get to the plot, The Resident is unfortunately one of those films that actors make on their bad years and this is unfortunately one of those Swank. The problem with The Resident is the plot and even with the talented Swank behind it, everything seems too forced and overtly complex as it tries to be too clever for its own good. It even has this telemovie film to it, hence the reason I'm guessing it was a direct to DVD/Blu-ray release. If copying is the greatest form for flattery than The Resident pays homage to a variety of films that centres around young women being harassed in their New York apartments. The story is about an ER doctor and after breaking up with her boyfriend, she needs a new apartment. Thankfully, she receives a call from a landlord named Max (Jeffrey Dean Morgan) who offers her an amazing apartment in New York. When Deverau investigates the apartment, she realises that this is her dream apartment and is not only in an amazing location but the rent is too good to be true. The old Latin saying of Caveat Venditor of seller beware rings true here as you can almost imagine everyone else watching this movie shouting for this doctor not to take up Max on his offer. To complicate things even more, Juliet has a brief fling with Max that triggers his unhealthy obsession with her which leads to just more than stalking. Max is a creep and as landlord, he has unfretted access in this property as he sneaks into her apartment at night... to watch and then increase the ante to appease his sick obsession. Without spoiling the ending, you can pretty much guess how this movie will end. Max is a creep! The video quality of The Resident has been transferred to AVC/MPEG-4 that contains a good level of saturation, vibrant colours when used, deep blacks and some rather clear image quality. There is a little bit of grain but overall, the quality is quite good for a straight to DVD/Blu-ray film. Audio supports a DTS-HD Master Audio 5.1 soundtrack that utilises the channels well in order to draw you into this creepy film. Dialogue is sharp and the levels have been implemented perfectly to match the video. Extras? Zippo! In the end, The Resident bombs considerably and relies way too much on those films of the past from the elements of Hitchcock to more modern interpretations of single women living by themselves. Unfortunately even the talents of Hilary Swank could not save this film which is a shame because she is a very good actress. Maybe next time!